GY Series fruit penetrometer with 3 models: GY-1, GY-2, GY-3, which special for inspecting the hardness of the fruits, such as apple, pear, strawberry, grape and so on. Judging the harness and mature of the fruits will good for breed, deposited, export, transport, machining, etc.They are wildely used for fruit research department, fruit company, fruit farm, college and so on. 3.5mm is used for testing soft fruits, such as apple, pear, strawberries and grapes. 8mm is used for testing a little hard fruits, such as cantaloupe. 11mm is used for testing the hard fruits, such as pawpaw, immature apple. 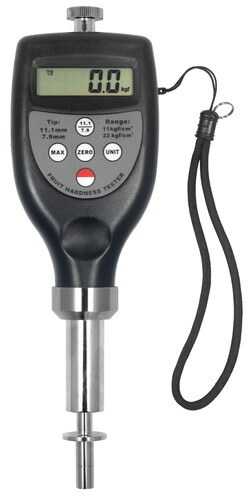 GY-4 digital Fruit Sclerometer which is to measure the hardness of apples, pears, strawberries and grapes, etc. It is a suitable instrument for fruit company, fruit farm, fruit research institutions to test the ripeness of fruits. With compact size, low weight and ocular reading, it is suitable to use on the scene. It also can be applied with its matched test stands (HPA Test Stand) to improve the accuracy. Please be noted, the stand used for GY-4 is HPA Test Stand. * SRFH series is an indispensable tool for growers. * By measuring force required to plunge into fruit pulp, inferring ripeness, SRFH assists in determining the picking time or monitoring softening during storage. * Applies USB, Bluetooth ™ data output.